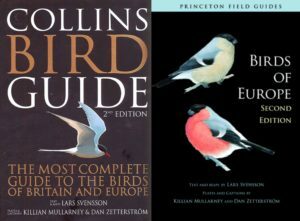 Collins Bird Guide/Birds of Europe (Svensson, Mullarney and Zetterström). This guide is the best for North Africa. It covers Morocco east to Egypt. The plates (complete with identification pointers) are excellent and are designed to facilitate species identification. This is one of the world’s best field guides. The e-guide (app) version is excellent and also has all the bird calls, often multiple calls/songs for each species. Unfortunately the app does not incorporate any photos, however videos of each species can be downloaded. Birds of Europe with North Africa and the Middle East (Jonsson). The artwork is very nice, but maybe not the best suited to a field guide. The arrangement is a bit spotty as well. The range maps are fairly good, and this book does cover those species in North Africa. Birds of the Middle East and North Africa (Hollom, Porter, Christensen and Willis) covers the countries of Morocco, Algeria, Tunisia, Libya, and Egypt. The plates are slightly dated, but decent, as are the range maps, and there is fairly good species information. There are also a fair amount of line drawings in the text as well, which helps. Birds of the Atlantic Islands (Clarke) covers the Canary Islands, Madeira, the Azores and Cape Verde. It has good plates covering 450 species with local subspecies and plumages. The text is concise. Unfortunately there are no range maps. The information is separate from the plates. 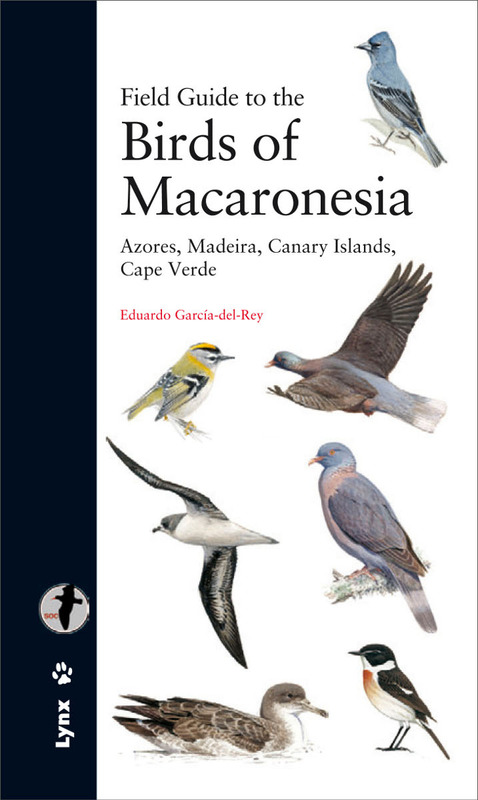 Field guide to the Birds of Macaronesia (Garcia-del-Rey) covers the Azores, Madeira, Canary Islands and Cape Verde. This is a great guide for any birders visiting the Macaronesian islands and includes detailed species text with good, large illustrations. Unlike above it does have detailed distribution maps for each species. Birds of Western Africa (Borrow and Demey) – the second edition arrived on the shelves in late 2014 – hooray! In our opinion, this is the best guide for birding Mauritania, Mali, Niger, Chad, Guinea-Bissau, Guinea, Sierra Leone, Liberia, Ivory Coast, Togo, Benin, Burkina Faso, Nigeria, Central African Republic, Cameroon, Equatorial Guinea, Gabon, and the Congo. There is also a section at the back of the guide covering São Tomé, Principe, and Cape Verde. Please note that the DRC is not covered by any guide except for “Birds of Africa South of the Sahara” shown below. 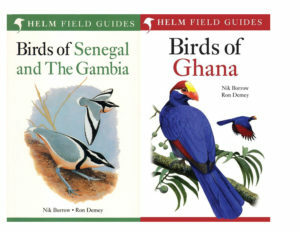 Birds of Ghana and Birds of Senegal and The Gambia (Borrow and Demey). For Ghana and Senegambia, these two books are much less awkward to use than the above, which covers too wide an area. As they cover fewer species than above, it means the plates are less cramped with more information for each species and detailed distribution maps. Birds of East Africa (Stevenson and Fanshawe). The above is by far the best book for birding Tanzania, Kenya, Uganda, Rwanda, and Burundi. The illustrations are good, and considering the guide covers nearly 1400 species, there is an impressive amount of species information with distribution maps opposite the plates. We can also endorse the long-awaited app (e-guide) version, which has all the bird calls. Birds of the Horn of Africa (Redman, Stevenson, and Fanshawe).This is by far the best book for birding Ethiopia, Eritrea, Djibouti, and Somalia and the mysterious Socotra Island (which is politically part of Yemen but with an interesting Arabian Peninsula/African faunal character). A very similar style to the abovementioned book but with more detailed distribution maps, with a less cramped feel. Roberts Bird Guide (Chittenden, Davies and Weiersbye). This guide along with the Sasol guide (below) are the two best guides currently on the market, covering the countries of Namibia, Botswana, Zimbabwe, the southern half of Mozambique (south of the Zambezi River), South Africa, Lesotho, and Swaziland. The annotated plates are excellent and depict most species in a variety of ages, sexes and breeding plumages. Photographs have been used to further aid identification or to show interesting behaviour. For tough-to-identify groups entire spreads have been devoted to their identification. The updated distribution maps are based on current atlas data. Additionally the Roberts bird app is excellent; it has a diverse repertoire of songs and calls for most species, uses both photographs and illustrations, includes birding site information and has a huge amount of information for all species, from identification to population size to feeding habits. 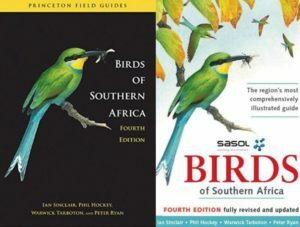 Birds of Southern Africa (Sinclair, Hockey, Tarboton, and Ryan). Like the above book, covers Namibia, Botswana, Zimbabwe, the southern half of Mozambique (south of the Zambezi River), South Africa, Lesotho and Swaziland. This book does not go into as much detail as Roberts with regards to bird identification in the text however the text is more than adequate. The illustrations are good (also showing a variety of plumages) and the maps are clear and accurate. The Sasol guide has been the go-to southern African field guide since it was first published in 1990 and the fourth edition continues to impress. As far as the app (e-guide) goes, we rather recommend Roberts (see above) than Sasol, as Roberts has more comprehensive bird sounds and information, however we feel the photographs used in the Sasol app are superior to Roberts. Newman’s Birds of Southern Africa, tenth edition. Revised and updated with decent plates, range maps, and information. This is one of the classic original southern African field guides and, again (like the previous three books), covers Namibia, Botswana, Zimbabwe, the southern half of Mozambique (south of the Zambezi River), South Africa, Lesotho and Swaziland. Birds of Botswana (Hancock and Weiersbye). This guide is the best one to buy if you’re only visiting Botswana (but if you set foot in Namibia, South Africa or other neighbouring countries, then it’s better, of course, to get one of the regional field guides mentioned above). 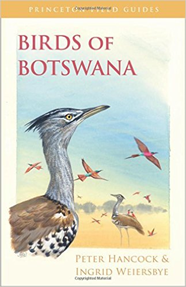 What’s truly great about this Botswana-specific guide is that it gives detailed seasonality information (for example, instead of just saying the species is a “summer migrant”, it shows relative abundance each month of the year). Satisfyingly, it also provides some extra information not directly related to identification, while remaining compact enough for a field guide – this means that one can learn a bit about the birds you are seeing (e.g. conservation status). Birds of Malawi (Newman, Johnstone-Stewart and Medland) is a good supplement to one of the three southern African field guides listed above if you are planning to bird Malawi, but please note that the book does not illustrate any of the species covered by those three books – only birds found in Malawi but not in the countries covered by the above books. It’s only a supplement! Roberts Geographic Variation of southern African Birds (Chittenden, Allan and Weiersbye) Something entirely different for tose wh like to get into the intricacies of bird identification. This is useful and fun guide to take along with you when birding widely throughout southern Africa. This guide only covers 230 species and thus should only be as a supplement to one of the other field guides. Birds of Africa south of the Sahara (Sinclair and Ryan). This is the book to help you plan the next African country you need to visit! Having very many bird species, it is less useful as a field guide, except in countries such as the Democratic Republic of the Congo and in Zambia, neither of which are covered by any other guide available! This is a must-have book if you’re interesting in birding the world, or if you just enjoy armchair birding! Birds of Madagascar and the Indian Ocean Islands (Hawkins, Safford and Skerrett). This impressive guide is our go-to guide for exploring Madagascar and the Indian Ocean islands. The illustrations are well done and take into account the region’s many subspecies, with the distribution maps and species texts opposite the illustrations. Birds of the Indian Ocean Islands (Sinclair and Langrand). This is the third edition of this guide and has been completely updated. It covers the islands of Madagascar, the Comoros, the Mascarene Islands and the Seychelles. Birds of Seychelles (Skerrett, Bullock and Disley). A useful guide to take along when visiting the Seychelles islands. As it covers a fairly small selection of species it is able to give detailed information for each species and often displays a number of illustrations per species, showing different ages/sexes etc.